Big institutional investors are sitting on billions of dollars they’d like to pump into the marijuana industry, but that’s not likely to happen as long as cannabis remains illegal in the eyes of Uncle Sam, according to investment mogul Kevin O’Leary. 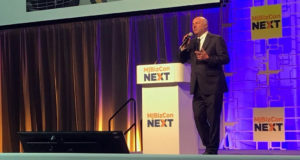 O’Leary offered his predictions and advice for the rapidly growing cannabis industry as the keynote speaker Wednesday at the kickoff of MJBizConNEXT in New Orleans. The cannabis industry conference, hosted by Marijuana Business Daily, runs through Friday and is expected to draw 3,000 MJ professionals and 280-plus exhibitors from around the globe. Pension funds and other institutional investors that must comply with a host of federally mandated financial reporting rules continue to sit on the sidelines because of marijuana’s illegal status in the United States. “I should own 20 positions (in marijuana investments), but I can’t own one,” said O’Leary, a co-founder of O’Leary Funds. “I can’t break the federal law. I have to be compliant. Legalizing cannabis for medicinal use on a national level, he said, would be the fastest way to lift the risks keeping investors at bay. Federal lawmakers are more likely to support that effort in the near term rather than full-blown recreational legalization, according to O’Leary. “I think the industry is missing a big opportunity to entice billions of dollars of investment,” he said. Chris Walsh, founding editor and vice president of MJBizDaily, told conference attendees the industry is experiencing “the end of these Wild West days” as cannabis moves into the modern age. Massive sales growth, with recreational marijuana sales in 2018 expected to eclipse medical sales for the first time. MMJ is waning in states where adult use is legal: Colorado has seen a 21% decline in MMJ patients since 2014. Consolidation and the rise of chains and national brands: In Colorado, for example, five companies run 70 locations. Smaller players getting squeezed out: Medical marijuana is moving into the hands of well-capitalized companies. Some potentially negative aspects making headlines, such as claims in some areas of a link between marijuana and increases in traffic deaths, teen-age hospitalizations, crime. There isn’t necessarily a link, but “if there is a link we as an industry need to be prepared” to respond. Regulatory models, regulations and structures remain all over the map. The development of a global industry. Federal breakthrough? President Trump recently said he won’t impede the industry, former House Speaker John Boehner changed his mindset on marijuana, Senate Minority Leader Chuck Schumer is drafting a state-rights bill, Sen. Majority Leader Mitch McConnell is sponsoring hemp legislation, and Attorney General Jeff Sessions says that maybe marijuana should be studied for medical benefits. “Ultimately what’s going to drive change at the federal level is public support,” Walsh said, adding that just about every poll shows that roughly 60% of Americans support legalized marijuana. Jesce Horton, CEO of Saints Cannabis, discussed in his keynote about how he gave up a lucrative software job to follow his passion, and the challenges he faced in doing so. Wednesday’s events also featured a general session featuring industry visionaries, Day Two of an Executive Summit, legal sessions sponsored by the National Cannabis Bar Association and roundtables on cultivation and extraction.